Performance, Orchestra, Choir, Photographic Lightboxes and Video Projections. Collaboration with Aspiro (formerly Carlow Young Artists Choir) under the directorship of Mary Almond O’Brien. 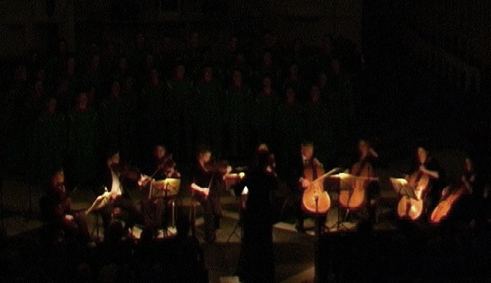 Creation of ‘light orchestra’ to accompany choral and orchestral performance of Fauré’a Requiem on the 30th of April 2006 in the Cathedral of the Assumption, Carlow. Funded by The Arts Council. The aim of this project was for the choir members to gain a deeper understanding of the piece of music, through exploring how the composer dealt with the theme of mourning and loss. The presentation of the artwork produced by the choir in response to the music, also aimed to create a more engaging and accessible experience for the audience. Each choir member produced at least one piece of photography, animation or video work. The videos and animations were displayed on large screens either side of the choir, while the photographs were displayed on light boxes that were placed throughout the crowd. The choir members had ‘scored’ the artworks, so that they would be illuminated in synchronization with the appropriate part of the music by which they were inspired.